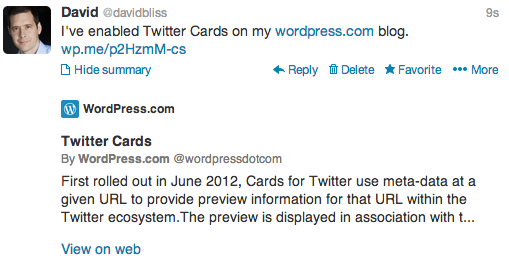 First rolled out in June 2012, Cards for Twitter use meta-data at a given URL to provide preview information for that URL within the Twitter ecosystem. The preview is displayed in association with tweets which include the URL (or a shortened form of it). Because it greatly improves the appearance of site content within Twitter, including meta-data to support Twitter Cards is considered good site hygiene. Blogs hosted here on WordPress.com include all the data needed for Twitter Cards, but that data will only appear if you submit your site to Twitter. Below is a preview of this post. This entry was posted in stuff and tagged social content, twitter. Bookmark the permalink.